A hazardous materials spill in Pinole of ammonia and bleach sent three officers to the hospital and crews scrambling to clean up the mess. 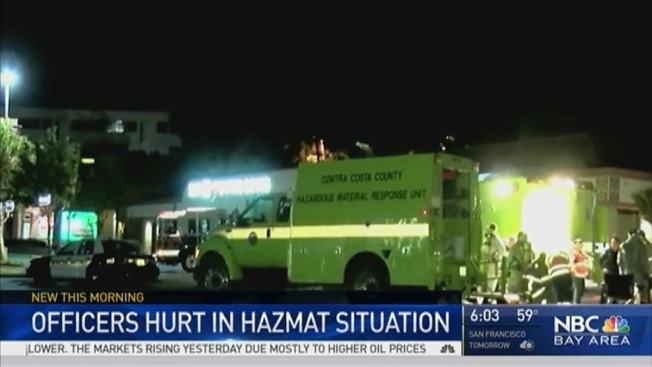 Contra Costa Fire Protection District Battalion Chief Lou Manzo told NBC Bay Area about five gallons of ammonia and seven pints of bleach spilled from a vehicle at the Pinole Vista Shopping Center off Appian Way near Interstate Highway 80 late Monday evening. Officers reported they had difficulty breathing, Manzo said, but have seen been checked ou t and ar now OK.
Crews worked for several hours overnight to clear the area of the chemicals.